With every article I post or write, or comment upon, I earnestly want to present truth. I don't want to be known as a fear monger, a "gloom and doomer" or as the boy who cried wolf. But, the fact is that the more I read, the more I research the darker the days become. Not for me personally, although I confess I am not immune to it either, but for this nation, and indeed the world. There is a big part of me that wants to not believe any of this. I would like to go back to being carefree and whimsical here in the "good ole U.S of A.". But how do I ignore the signs, their very own words, their very own plans? How do I ignore the painfully obvious fact that the POTUS is nothing short of a Manchurian Candidate? How do I ignore the voter fraud, the complicit media? How do we ignore the leftist backgrounds of many people in the highest places? 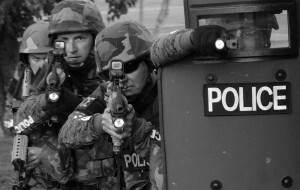 How do we ignore the ever increasing Police State? The U.N.? The FED? Radical Islam- inside our nation and inside our government? How do I ignore growing Socialism inside the nation? How do I ignore a sleeping citizenry in which anything can and does get by them no matter how "in our face" they have become? How do I ignore the purposeful mounting and unsustainable debt that no real leadership would EVER allow to happen to a nation if they cared for that nation and the people in it? How do I ignore that we have crisis after crisis and NOTHING ever gets resolved? How do I ignore a government that wants to disarm its people? Likewise how do I ignore the prophetic scriptures that have predicted a last days One World Government, One World Economy and One World Religion, and a world gone mad, all of which this world seems to be merging into? So I am posting this story. You won't want to sing and dance when you finish it. But perhaps it will give you pause. Perhaps it will make you think, about what is important, and what you can do. Time is short. Perhaps you have never thought of yourself as a freedom fighter or a partaker in a resistance. No need in the "good ole U.S. of A. "...but those days are now hanging in the balance. - W.E. Each and every day now Obama and his syndicate government are pushing harder and harder for the removal of all of our liberties, in order to place us into slavery and create a permanent police state. Members of the Obama syndicate and the growing New World Order globalist elites long ago came out into the open with their plans. From Agenda 21 (to steal all private property and move humans from rural environments to urban centers where their movements and population numbers will be easier to manipulate and control) through the removal of all human rights (while the “overseers” say they are actually installing them)–in America that’s nullifying the US Constitution and substituting it with ObamaLaw–and replacing the God of Abraham, Isaac and Jacob with the worship of Lucifer (also known as atheism and Islam) our planned overseers are now daily stripping us of everything we have and punishing our beliefs if they do not subscribe to the worship of both their malevolent vision and dark lord. This is what’s occurring. It’s directly in front of us, now, and in our faces. Their article called for ‘cadres of aggressive organizers’ to use ‘demonstrations to create a climate of militancy.’ Intimidated by threats of black violence, politicians would appeal to the federal government for help. Carefully orchestrated media campaigns, carried out by friendly, leftwing journalists, would float the idea of ‘a federal program of income redistribution,’ in the form of a guaranteed living income for all — working and non-working people alike. Local officials would clutch at this idea like drowning men to a lifeline. They would apply pressure on Washington to implement it. With every major city erupting into chaos, Washington would have to act. Obama has been summarily firing and replacing US Constitution-upholding Generals and Admirals in the US military with those who will, instead, swear their allegiance to Obama and the United Nations group. Note: Multiple source links to these are available in my past columns. It strongly appears that Obama may also be creating massacre scenarios, in order to confiscate law-abiding citizens’ legally owned firearms–”never let a crisis go to waste” even if you have to create it? 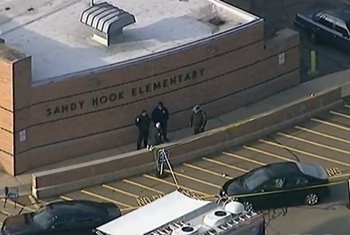 Was the latest the tragedy and horror perpetrated at Sandy Hook? At first–and second–glance I dismissed the information and videos stating that this was all part of the Obama coup to remove our weapons. However, there are so many anomalies, exposed, intentionally provided false directions and openly (again…in our faces) faked media footage, that it presents us with the necessity of asking questions. There were many who legitimately lost their children and other loved ones from the madman who slaughtered so many innocent lives. For those people, nothing but God and time can help their real pain. But, at least a few of the victims who supposedly lost their children on that horrid day are shown relaxed and smiling just before their “press conferences” when they visibly change their expressions. Note: To date I have not seen these “debunked” nor even addressed by the debunkers. Some also seem to have been “victims” at other recent massacres. Also, in all three recent shootings–Colorado theatre, Oregon Mall and Sandy Hook–multiple witnesses report additional shooters who seem to have gotten away. Debunking these ostensible “conspiracy theories” originally presented a full time job for many leftist and at least one conservative site. But, not all of them have been debunked. We will have to make up our own minds but, we need to consider all of the evidence. We certainly should have learned by now that, with regards to the actions coming from the Obama syndicate, there are no coincidences. One thing, however, that we do know with certainty is that in each of these circumstances, the shooters were taking anti-depressant psychotropic drugs…drugs that, over the years, have proven to have caused multiple suicides and homicides enacted by patients ingesting them. Since 2009, Obama has been using military helicopters to fly over US cities and tanks and other heavy artillery in “training exercises.” These cities include but, are not limited to Boston, Los Angeles, Miami, and Boulder. This is a first in our history as a nation. The populations are not warned ahead of time, in order to create the maximum amount of fear of their government. Obama used the helicopters to fly over residents in Worchester, Massachusetts and literally dive-bombed residents homes waking them up at midnight and his latest escalation in Obama’s ongoing war against US citizens was a fly-over and joint military-local police exercise conducted this month in Miami, FL. This time, however, gunfire was added to make it seem more real. The citizenry was not warned ahead of time and many ran for cover. This, my friends, is your government at work…working, that is, to either force you into submission (better give those guns up or else!) or begin the second US Civil War. After all, Obama has now had plenty of practice at doing so–with both his Egypt and Libyan excursions. You didn’t really think those were about democracy did you? They were about installing Obama’s Muslim Brotherhood as the rulers of those countries, while he used their populations to practice on how to affect his total takeover of the USA…for himself and Islam. We didn’t vote him out of office and I do realize “the fix was in” so that all too many of our votes against Obama were not counted. Therefore, he is now in the process of stepping up his destruction of this country and its population. Or, you can choose to be slaves. That is always a possibility. If you do not want to, again, be a free people and take the responsibility of taking back our country, the freedom to worship our God and ridding ourselves of our oppressors–predominantly in Washington D.C.–you may choose to die slowly. These are now the only two options left. Obama’s war–the War against America–has already begun in earnest. Thus far, our military and too many local police are training to bring us down. May God bless all who choose to fight and bring back the Republic. And the king shall do according to his will; and he shall exalt himself, and magnify himself above every god, and shall speak marvelous things against the God of gods, and shall prosper till the indignation be accomplished: for that that is determined shall be done.